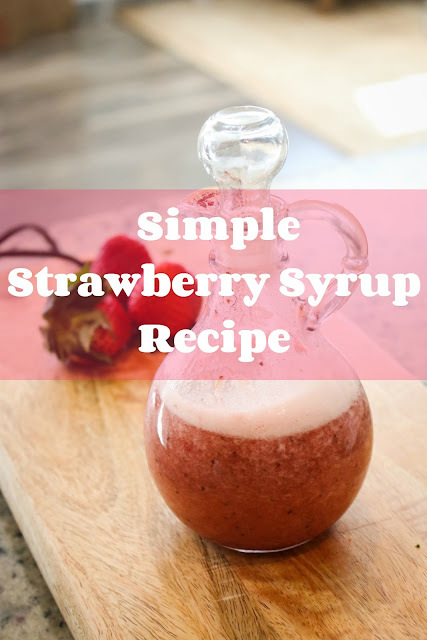 This hardly constitutes a blog post but I'm obsessed with strawberry syrup lately so I thought I'd pop in and share an easy recipe. 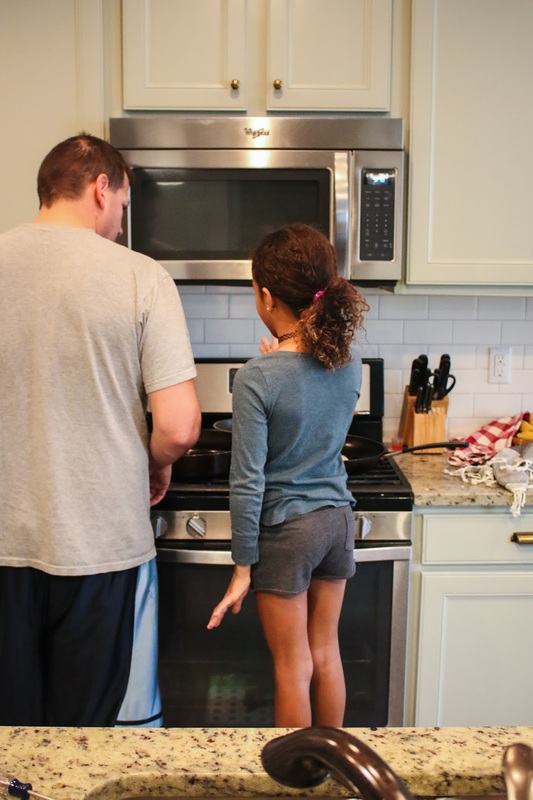 We eat pancakes every single weekend and sometimes it gets old. Adding fresh fruit syrup, caramelized bananas, nuts, chocolate chips, or sprinkles is a fun way to mix it up. I decided to make strawberry syrup on a whim one weekend and there's no turning back now! 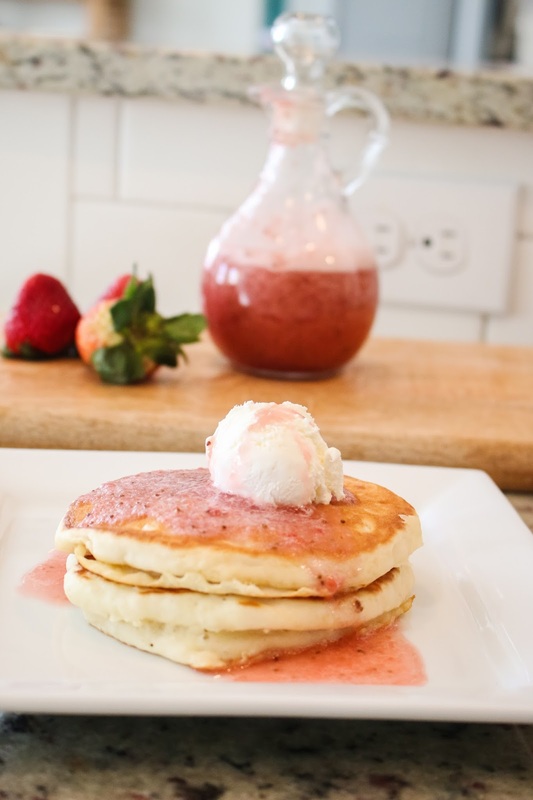 You can use the same recipe to make blueberry syrup. When you walk into the kitchen on a Saturday morning and hear your husband teaching your daughter how to make perfect scrambled eggs, you take a picture. Right?? Besides pancakes, I've mixed this strawberry syrup with seltzer to make better-for-you soda and used it to top vanilla ice-cream. It's delicious. Why yes, I should have cleaned my stove before snapping this picture. I don't always eat my pancakes with strawberry syrup, but when I do, I also add a huge scoop of whipped topping. The color gets deeper and redder over time. I've eaten it up to a week and a half after refrigerating it. I bet it lasts longer. Also: I love this sweet little cruet. 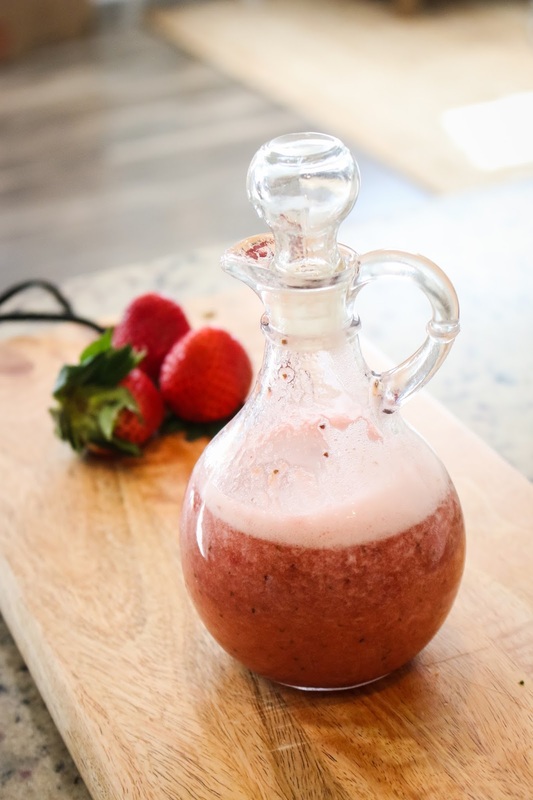 I use it for homemade salad dressing, cream for coffee if I'm hosting, oil/vinegar, etc. Step 1: Bring the water and sugar to a simmer over medium heat. 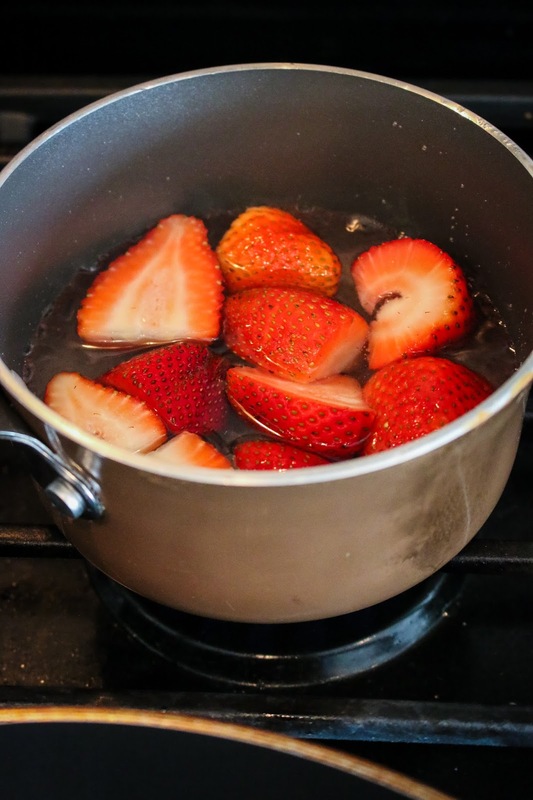 Step 2: Once simmering, add strawberries and cook for about 5 minutes. 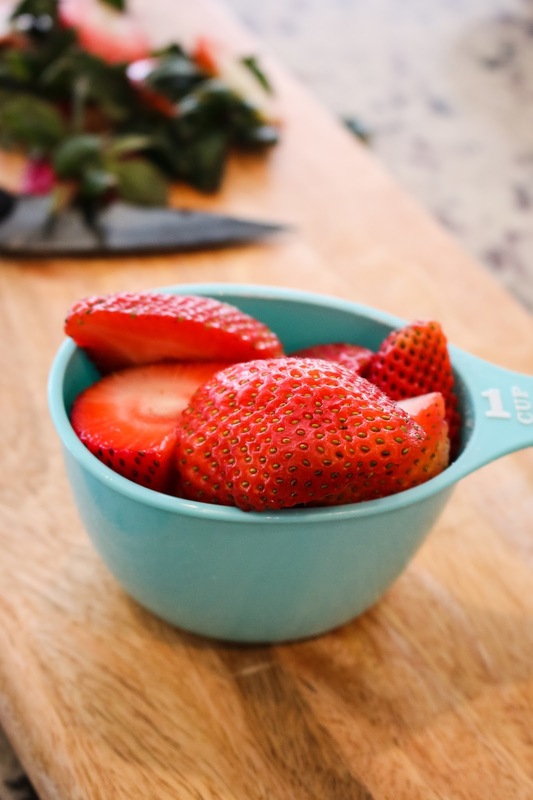 During that time you can muddle the strawberries with a wooden spoon but don't worry too much since you'll be pureeing. Step 3: Let cool. I'm usually too impatient to let the mixture cool all the way but I have a blender that won't explode with hot liquids (it's this one). Technically you should let cool to room temp. 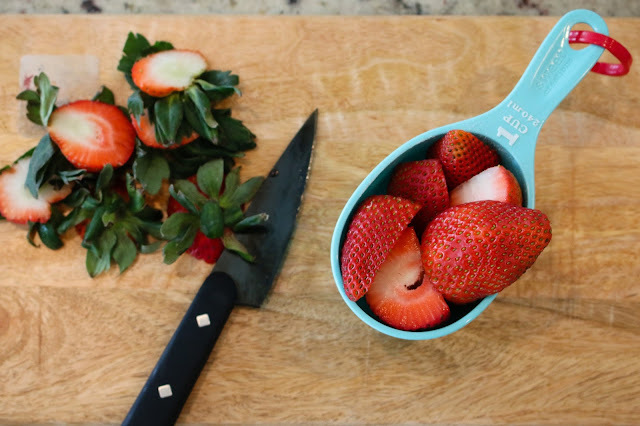 Step 4: Use an immersion blender or a regular blender to puree. Step 5: Pour it down your throat like the domestic goddess you are.